According to recent statistics, subclinical hypothyroidism may be more common than type 2 diabetes. In this podcast Dr. Amy Nett and I will discuss the thyroid physiology behind this thyroid disorder and its clinical consequences. 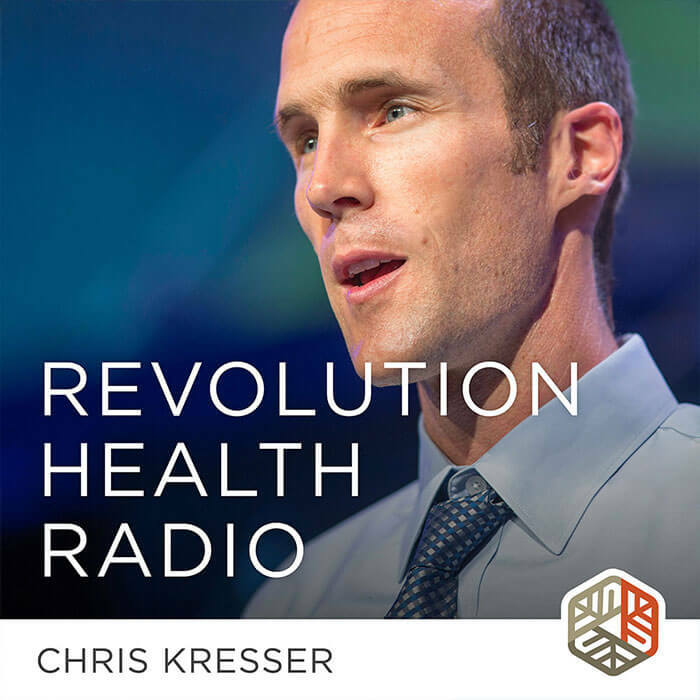 I’m Chris Kresser and this is Revolution Health Radio. This episode of Revolution Health Radio is brought to you by 14Four.me. 14Four is a diet and lifestyle reset program I created to help you dial in the four pillars of health—nutrition, physical activity, sleep, and stress management. Whether you want to lose weight, boost your energy, treat a chronic health problem, or just maintain your current good health and extend your lifespan, these are the four areas you need to focus on before anything else. In the 14Four program, I walk you through every step of the process, from cleaning out your pantry and shopping for the right foods to recipe and meal plans to video demos of workouts that you can do at home without any special equipment to guided meditation and stress management programs to daily sleep tips to personalized recommendations for what to do after you finish the reset. 14Four is a great option whether you’re just getting started with this stuff or you’ve been on the path for a while. In fact, I do a 14Four myself three or four times a year to hit the reset button and give myself a boost. To learn more about how 14Four can help you achieve your health goals, head over to 14Four.me. Ho Chris and fellow sufferers I need help I have fibromyalgia for the last. 23 years and with last 3 years feeling worse.I am seeing a doctor next week who prescribes LDN for fibromyalgia. Chris, 2 years ago I stopped eating gluten my TSH was prior 4.59, then it dropped to 1.5… but then slowly went back up. Just this last week I started on Armour. The pain in my hands and feet are already gone. I had TPO of 8. Just wondering, is it too late to try doing other things than medication? I was going to take iodine, but read that this is not good for H’s . Am I stuck on meds now for life? So many practitioners seem to ignore the fact that bromine in our flours and fluoride in our water makes it impossible for the thyroid to take in the iodine that is probably less than we need in the first place. I avoid most seafood because of mercury contamination so no iodine there. Iodine is a poison or iodine is a solution? Well if you have an under active thyroid gland you can use the food you eat to cure it as I did with my fiancée, the food you eat can heal your body other food you have to stop eating because it interferes with this process! I am busy ATM writing several books that heal your body! I’ve recently been diagnosed with subclinical hypothyroidism and prescribed Eltroxin which I haven’t started. I put a lot of effort into fitness and diet but maybe I’m doing something wrong. I’ve seen a doctor, who practices homeopathy and variety of other things as well, in an attempt to do this without drugs. I’d be interested if you’ve already written a book on the subject. Otherwise any info you on how you cured your fiancée would be highly appreciated. There is no such thing as borderline hypothyroidism, only miss-diagnosis. Your entire discussion is inaccurate. There are 6 distinct forms of Hypothyroidism. Basal Body Temperature taken orally correctly and reliably will enable one to make a diagnosis of hypothyroidism, but will not give one the information on how to treat it. HTMA (hair tissue mineral analysis from a reliable lab) is needed for types 2,4, and 6. Blood tests for types 1,3, and 5. Please read the Calcium Lie 2 to get the correct information and watch the book lecture for type 6, not discussed in the book. These are scientific, all observable, measurable, and reproducible and all the information regarding the conclusions is already published, just ignored. The TSH is about the most unreliable of all tests to diagnose and even worse to treat this prevalent illness now affecting nearly 80-90% of the USA and the world. 12 scientific studies have shown the TSH is unreliable in the diagnosis and treatment of this disease. The worst possible doctor one can see to make a diagnosis and get proper treatment interestingly is an Endocrinologist, as they believe (religion) they know how to treat this disease and not science practice (focused on measurable reproducible data). Sad, but true. Calciumlie.com for more information. Robert Thompson, M.D. Check levels of t3 free or total and rT3 to know for sure and BBT’s. Dr Robert Thomas you are a genius. I’ve just received the HTMA back this week, read the book Calcium Lie2 & will look up the book lecture on type 6! Yeah that’s right, my fiancée had an under active thyroid gland, I know that you need to stop eating some foods and eat more of others, this will heal the thyroid gland in actual fact you need to heal the T4 that will then put the T3 right in turn heal one to heal the other, taking tablets for this is no good to heal it most drugs let’s say just put a plaster on it complaint then you need to replace it it ha bigger plaster until the plaster just doesn’t fit anymore, you can cure things the natural easy way most of the time! My problem is that I was diagnosed with thyroid cancer , and had both thyroids and lymph nodes removed . The Mayo Clinic said it was due to x-ray . I can not find a Doctor in my area that will either not take Medicare or will not give Armour . I went to an Endo. for years and he kept me on synthroid . I kept telling him , how bad I was feeling , and kept getting worse . His answer to me was I had cancer what do you expect . Since then I have found out I have severe adrenal insufficiency . My family Doctor is trying to take care of this , but does not know how . I can not go on living like this , I have no life . I don’t go out of my house , except for going to the Doctors office . I don’t know where to turn , or what to do . I live in Charleston , WV . You could always contact my Naturopath. Even though you live out of state I bet she could order labs, and do everything for you on the phone consult and via email. She could prescribe you what you need. Its worth the money. I’ve been waiting FOUR months to get into a endocrinologist. Who should I be seeing for my thyroid issue, ALL my blood tests are off indicating, my internist says “a transient issue” that may not need to be treated. He got this from my negative antibody test results. Hypothyroidism is caused by low carb dieting. Without high levels of liver glycogen thyroid hormone does not get activated and the metabolism slows down by default. This is why most people find their digestion/tolerance of carbs worsens overtime on a lie carb diet as digestive tract function declines. A high simple sugar, adequate protien, low fat diet can reverse hypothyroidism. That is right to a point there are foods you don’t eat as well as them that you do! In lots of illnesses there are foods that can heal you, there are those foods that will stop the process of the foods healing you! Yes it can be fixed if you know what you are doing I fixed or should we say healed my fiancé’s after the doctor said she would have to go for a biopsy we in 5 weeks nothing needed. Look eat loads of protein foods, leave out most of the foods that would boost your immune system it’s you immune system that is attacking your thyroid in hassimotos disease, it sees the thyroid as an invader so you must stop foods that help to boost the immune system so the protein can do its work! I will not be commenting on any more posts for now, thank you! Take care be healthy God bless everyone! James! 1) How can you eat paleo (or any medium to high fat diet) when your thyroid is under-performing and digestion is not working well? According to a famous triathlete, a state of ketosis in particular prevents conversion of T4 into T3! 3) According to some (including Dr Sara Gottfried, if I remember correctly), women may do better on a few more carbs than men. The “exercise more, eat paleo” approach will work to improve thyroid function in sedentary people eating the S.A.D. diet. However, athletes and (too) keen exercisers or fitness trainers teaching many classes a week may actually do WORSE when increasing exercise and keeping carbs low. While I never actually ate strict paleo, I eat mostly (raw, blended or cooked) vegetables, some protein, fat as tolerated (high amounts of fat were making me feel sick) and a little fruit. I was having trouble digesting and – in spite of increased exercise and non-processed diet with NO gluten or dairy (which cause me issues), I managed to put on substantial amounts of body fat on my thighs and hips. I then noticed that I kept losing weight and body fat effortlessly while on holiday, doing basically NO exercise, eating as much as I wanted (I don’t drink). Yes partly this was because my adrenals would be recovering while on holiday, but that was useful info… things clicked and found the right approach for me. I am mentioning my story in case you are also a crossfitter, athlete or person (particularly a woman) who trains hard and frequently and eats paleo or low-carb and NOT seeing results, or perhaps seeing even worsening of their physical condition (fatigue, worsening performance, fat gain). Slack off a bit, take more rest days (or weeks, if you can) of course sleep well, take one hour of “silent” time a day (breathing, relaxation, meditation or maybe just stretching) and eat more of what you fancy, as long as you keep the processed stuff low (or avoid it altogether). Just want to mention, because I’ve had issues with this myself, that Paleo should not be low carb. I ate too few carbs when I first started Paleo and also had issues with energy and brain fog. Eat your fill of sweet potatoes, potatoes, bananas, etc. It’s good to remember that the indigestible fiber doesn’t count toward your carbs anyways. eating more can actually help so much! I can’t find any reference to this either or to low TSH being related to strokes. Sometimes I think Chris gets confused between studies. It looks like this study to me, although it’s dated in Aug.
I’m very interested in the diurnal rhythm of TSH. Can you give a little more info regarding that? For instance, in a euthyroid person, would it typically start out low and increase later in the day? Or is it likely to go up and down throughout the day? Whoops, I don’t know how that comment about diurnal rhythm ended up here. It was intended a a general question. I’m surprised I’d never heard this mentioned before by any of the functional/integrative people that talk about thyroid issues. I misspoke in the last part of my previous comment. I meant is it likely to go up and down in someone who does have a thyroid condition? Sort of similar to what can happen when cortisol is dysregulated (When it isn’t just a reversed or completely flat rhythm)? I had to have my thyroids and limp nodes removed in 2007 , due to thyroid cancer . I have not had a good day since , and no one not even the doctor that I was going to at the time explain this to me . I kept telling him how I felt , and his answer to me was ” You have cancer what do you expect ” . I was very upset , and I have not been able to find a Doctor to take care of me . I now have been diagnosed with Adrenal Insufficiency …..I don’t know how much more I can take , I don’t even go out of my house anymore except to go to the doctor . I don’t know what to do , or where to turn for help . Dear Chris, You are the MOST interesting person I read, and have been since I first read you. I have been taking thyroid(Armour) since I was a child and my mother told my pediatrician the skin on my arms & legs was “rough”.As a teenager, I grew a bit lethargic, and heavy, so my thyroid dose was increased.I took 2 60 mg tabs per day most of my life.I’m 73 now. In my 60s, I developed several peripheral issues.I couldnt fall asleep well.I became lethargic.I had mental fog.Etc. My thyroid dose was raised to 2 60 mgs and a half.Felt a bit better, but soon: the other side of the coin: racing heartbeat, diarrhea, grinding my teeth when I DID sleep. Back down to 2 60 mg.Still was bothered w/racing heartbeat.So I took myself down to 1 60 mg Armour Thyroid per day. And that is where I stayed.My heart didnt race and that was my main concern. But NOW I’m too “exhausted” to go to the doctor and get my TSH et al checked.I can BARELY pull myself out of bed.I fall asleep in front of 11pm news. I wonder what you think about old bats who experience these issues?Need to add I had breast cancer @ 62, had 6 months of very STRONG chemo-one of which ruined my heart function & gave me worse edema each summer.That was The Red Devil, Adrieamycin.The other poison was Taxotere, made from the poisonous bark of the Taxine tree.This gave me perpetual irritable bowel disease. You can see why the thyroid symptoms bothered me, and why just I stayed with low tx.Might be sort of cretinous, but-seems the better choice.Maybe I’m too old to expect perfection. And I’d LOVE to hear your take on all (or any) of this. This may not be helpful if money is an issue. I wouldn’t know as I’m in New Zealand…but there is Tirosint. Tirosint® is a unique medication for hypothyroidism that contains no sugars, dyes, alcohol, gluten or lactose. It contains only four ingredients: levothyroxine, gelatin, glycerin and water. As well as taking this, some people also take Cytomel which is a T3 only medication. It can also come as in a slow release form. THANK YOU HONORA!! These look VERY good! I will call my pharmacist @beginning of week and inquire, also as to prices, before I call my doc. Joan thyroid hormones are T4, T3, T2 and T1. A T4 only med is about the worst thing you can do. It’s very likely your dose of Armour was too SMALL. Armour is full thyroid replacement hormone. It’s an all or nothing. Pounding or rapid heartbeat is more likely from too little hormone. A healthy heart needs T3. It’s the energy hormone. Please read info on stop the thyroid madness. It saved my life. Would the optimal levels of these thyroid hormones be different for a patient who is breastfeeding? Thanks! I have celiac disease and hypothyroidism that swings back between hypo and hyper. I was on meds for a couple months but felt even worse so went off them. What I don’t understand is I eat mostly paleo, I stopped drinking caffeine and alcohol, I get sleep, have a low stress job, exercise, take adaptogens, see my friends, family and I’m in therapy but I still don’t feel well. I have irregular heart beats as well. I’ve given up on my doctor because they just want to put me on meds, antidepressants, etc. what can I do to start feeling less fatigued, sluggish, depressed and more happy and energetic? You might want to do an adrenal function saliva test. Feeling worse on thyroid meds can be a good indicator of adrenal issues.Lots of us with hypothyroid also have adrenal issues. And the fatigue and irregular heartbeat could be related to that. Sometimes if you’re doing a really carb-restricted version of Paleo, it can be too little carbs when you have thyroid and adrenal issues. You might try more things like sweet potato (if you can handle those), hard squashes, and some fruit. Some people do well with regular potatoes and even white rice, too. But you might not want to try those since you have celiac. Other grains can cross-react (you probably know that) and nightshades tend to be a problem for autoimmune disease. I also wanted to mention, if you do need thyroid medication at some point, look for one that doesn’t have any gluten or corn in it. The fillers can cause reactions and interfere with absorption of the thyroid hormone. Nature-throid and WP are clean, but could still be problematic if you can’t handle lactose. also please check your iron levels… Sometimes low iron keeps us from getting on the correct amount of natural thyroid as well as adrenals. Take chelated iron every day.. It helped me.. I also take zinc and selenium and Vit D.
I think it’s the Ft3 that must be upper mid level and a Ft4 that is high in range or visa versa to feel your best. Putting T4 right will NOT necessarily automatically put T3 right, especially in the case of Hashi patients, most of whom need a med with T4 and T3, in order to get T3/fT3 right. Hashi is the cause of some 90% of hypothyroid in the developed world. Elderly who develop new hypothyroid are not usually Hashi, but could be. Well it works I have already done it with a person that was going for a biopsy and in only 5 weeks she went back to the doctors and was all clear, it’s not just what you eat it’s what you don’t eat to! If it works then use it? It’s great that you were able to help your fiancee with diet. Removing foods that are triggering autoimmune attack on the thyroid can make a huge difference. And sometimes nutrient deficiencies that affect conversion of T4 to T3 can be addressed through diet, as well. It believe it does come down to each individual’s situation, though. Sometimes diet alone isn’t going to be enough to correct all the deficiencies, and won’t always address all the root causes (i.e., leaky gut, infections, parasites, etc.). Many people have trouble converting T4 to T3, especially because a lot of that is supposed to take place in the gut. And some have a problem with too much converting to reverse T3, often due to stress/adrenal issues. Do you mind if I ask whether the biopsy was associated with a Hashimoto’s or non-autoimmune hypothyroid diagnosis? I haven’t had to do biopsy so far, just wondering when it usually gets ordered for other people. She went for a scan and they found thickening in her neck, just like polyps, the scan showed these lumps and she was very worried, her neck as a whole was thicker than it should of been, her results for her thyroid were really bad, I was at the doctors with her and told him I would put it right, 5 weeks later she had a test and it was normal his eyebrow lifted as he read the results and said that’s good news, so the diet works as it’s protein and feeds the cells this fixes the T4’s which In turn fix the T3’s! This took me 5 weeks but there are foods that you must stay off for this to work! Thank you for this podcast. It was very helpful. I live in TN and there are no doctors here who go by the tsh they go by the wide range. Up to 5 actually. They just say I’m fine. I’ve had hypothyroidism for two decades and am very ill. I finally just gave up on doctors. In all of TN there is not one that goes by the lower range for tsh. You also need your RT3 level tested too. They only used to test it if I demanded. So I don’t know where you think doctors will go by a lower tsh range? Couldn’t tell if your question was rhetorical, but my mainstream doc in Seattle says she prefers to keep TSH in the 1.0-2.0 range. Doctors are catching on, so don’t give up! If you have been only seeing primary care docs, perhaps an endocrinologist would have a more open mind. Hypothyroid is my diagnosis. With little being written about this 15 years I finally found the Paleo diet. What I realized was that I had gluten intolerance. That being said, I removed all harmful things in my diet. However, I am still not able to lose weight. I was on a diet with the husband planning, cooking for 3 months. He lost 18 pounds in that time not excercising, drinking and snacking a lot. I on the other hand lost 2 pounds in 3 months, excercising twice a day, once with weights and then cardio. I don’t drink and am moving 10 steps or more a day. Please do not tell me that because he is male he lost 16 pounds more then me. What would make sense is if I had at least lost 9 pounds to his 18. I am beyond frustrated. I am in my 60’s and still looking for a reason why my body collects so much fat or better yet doesn’t burn it. Can you help me? You could try a little more carbs and possible a little less cardio. Women and those with adrenal issues (which are common when you are hypothyroid) often don’t do really well in terms of weight loss and really just feeling well if the carbs are too restricted. And too much exercise can be counter productive sometimes with thyroid and adrenal issues. A little less exercise, or a different type, something like burst training instead of sustained cardio, can be helpful. If you have the autoimmune form, you might try the autoimmune paleo diet to see if it makes a difference. Could natural thyroid medication help to bring down really high cholesterol levels in someone who has low thyroid function and high reverse T3 (but TSH in the functional standard range, and no elevated antibodies)? Looks like we’re answering each other’s questions! Yes, my FT3 & FT4 are rather low, and my RT3 is high. I’m treating adrenals concurrently, and wish the RT3 would come down. Anyhow, thanks for answering. I’m hoping for some reduction in cholesterol but am not expecting a miracle. I have familial hypercholesterolemia, so improved thyroid function is probably not going to make a huge difference. But anything is better than nothing! Actually i found a list of research about how yes, NDT would possibly help quite a bit lowering cholesterol even familial hyper. chol….. Have you tried lowering NDT & adding t3 while working on adrenals? I was just wondering if Chris might remove the reference to the other author so let me just list the research. It’s long. Thank you Meera! I knew it could help with regular high cholesterol, but didn’t know if it would make much of a dent in mine. I’m going to look at those studies to see what the reduction amounts look like. I’m not sure if my doctor would prescribe T3. I’d have to be a little careful because I already have palpitation issues. I’m on WP Thyroid right now, but I think I might have to switch to compounded, because the lactose is affecting me. I’m already going 2 hours away to a functional doctor who would run all the tests and prescribe NDT. I believe I have central hypothyroidism, because my TSH has always been low normal but I have had lots of symptoms of hypothyroidism and taking thyroid helps a lot. However thyroid supplementation causes my TSH to drop to levels that alarm most doctors, who think I am damaging myself by overdosing. I have never had symptoms of hyperthyroidism by bringing my free T3 up to the high end of the normal range, which is what helps me most. I don’t know how common this type of problem is, but I would like to know if there is way to increase TSH to a level that stimulates adequate thyroxine production by mythyroid. Hi..i have Hashimoto’s, take Armour and my T3 T4 numbers very good but still, really tired. Finally had a saliva test to check cortisol levels, they were very low. Diagnosis: Chronic Fatigue…found : drlam.com…he is a functional medicine dr with a very thorough web site on CF and adrenal fatigue. It’s been 4 months of being treated by his team and I am feeling A LOT better. I am not completely healed but I have much better energy than before…check it out!! Yes, you must have good levels of iron, ferritin, and other things like cortisol before you will get success and feel good. I believe I am hypothyroid due to autoimmune problems. I found out on a study I took part in for diet and and arthritis that I could not eat wheat among other things. When I started taking thyroxine I was on 100 mg. and I was cheating on the diet. I then found out the antibodies to gluten last for months not weeks, and now I strictly avoid gluten, and the dose is down to 25mg. I suggest try looking up gluten/gliadin on the net if you are hypothyroid. You talked about the connection between low thyroid and heart disease. Are we talking about low TF3 that is not within normal range? Mine has always been at the lower end of normal like 2.8 ..
No one seems to know anything about primary pituitary/secondary hypothyroidism. Nothing seems to change the course of this problem, and so little is written or discussed on it. I also wonder if this is big factor in stage 3 adrenal exhaustion that will not respond to diet, lifestyle and supplement changes too. So much great info in this podcast, thanks! Just wondering the significance of having thyroid antibodies present even after bringing thyroid function back to the functional medicine standard of normal with lifestyle modification. Is it normal for these antibodies to hang around, should these slowly decline, or should other forms of treatment be considered? Thanks! I’ve seen a couple of places that say selenium supplementation (or possibly increased dietary intake) can bring down antibodies in Hashimoto’s. I believe suppplementation is supposed to stay under 200 mcg. Check out Izabella Wentz and Suzy Cohen’s sites, think those were the first places I saw it. NDT or natural desiccated thyroid is a prescription medicine. Armour thyroid and Naturethroid are two of those. I recently saw a comment that Armour thyroid has recently had the price increased significantly by a new manufacturer. Greed seems to be the watchword with pharma these days. Whew! What an eye opener. I had to have a thyroidectomy way back in 1974: severely hyperactive with goiter and non-responsive to oral medication. Since then (yes 40 plus years) I have really had physical issues galore: Weight loss resistance, chronic constipation, high cholesterol, brain fuzz, depression, and GERD to name a few. I am taking Levoxyl .112 daily. But I don’t feel “right.”. I’m told my thyroid levels are in normal ranges, but this article sheds new light on that issue. HOw do I address the new information given by y’all with my doctor without sounding like I’m questioning her knowledge and expertise. I’ve been patronized before with the “I’m the doctor” routine. I wish Dr. Amy practiced medicine in Alabama! Any suggestions on an expert in my area ? I’ve been taking thyroid hormone for a very long time, prescribed by a traditional primary care physician. What specific language do I use when I request she order tests to include free T 3&4? I was seeing a naturopath, and she prescribed a low dose of medication (Nature-Throid, 1/2 grain). The only thyroid test she ordered was TSH. I decided this was inadequate, and she probably wouldn’t be the best person to interpret more advanced testing, since she didn’t order it. Still, I could see where you could get better testing paid by your insurance, if ordered by your PCP. I would get a functional practitioner to interpret the results, though. Thank you for all you do and this topic. I listened to all the interviews on underground health and follow you and read your articles, but have found very little information on my situation. I am 36 years old and have been sub clinical HYPERthyroid for 5 years now, my TSH fluctuates but has been completely suppressed during my pregnancies and will come up to just below range when not pregnant. If you could address HYPER thyroid a little more and specifically Sub Clinical HYPER. I would really like to hear what you have to say. Thanks you. Try looking at Dr. Eric Osansky’s website, naturalendocrine solutionsdotcom. He treats both hypo and hyper naturally. I haven’t specifically looked for hyper info but he had Grave’s disease so I think there’s a good chance of you finding something useful. He does free webinars sometimes. You’re welcome! Hope you find good info. Thank you for starting a powerful conversation! In June of this year I saw my doctor due to painful joints and fatigue. He ordered blood studies including anti-nuclear antibodies, RA factor, and the usual CBC, lipids and complete metabolic tests. I overlooked advising him of the fact that I take a quality Iodine supplement containing all 3 forms of the mineral. Results included Lyme, slightly high LDL, slightly high Glucose, normal free T4 (1.02) but a high TSH of 6.4. I was treated for Lyme and received a prescription for .50mcg Synthroid. From what I can ascertain, my lab results reveal subclinical hypothyroidism but I am wondering if taking Iodine (or even having Lyme disease) could have skewed the Thyroid testing, Your opinion, please… Thanks in advance. High iodine can raise TSH, as the body tries to protect itself from what would otherwise be the destructive catabolic or meltdown effects of iodine excess. High iodine usage can cause both hypo and/or hyper thyroid symptoms. High iodine usage is highly controversial, with opinions raging from A to Z.
I wish well-meaning folks like yourself would site a study that backs up an assentation like iodine adversely TSH, or else we readers can only consider your words as unsubstantiated internet rumors. I’d be most interested in any literature to substantiate that iodine raises TSH; I never had a problem w/my thyroid but recently had bloodwork while taking iodine that revealed a subclinical hypothyroid condition. Now I must clean my system of both iodine and selenium and have the test run again to ascertain “accurate” data. That high iodine usage can often raise TSH is for me observational from the thyroid- and iodine-related community groups et. al. over the last 10 years when high iodine usage has been “popular” and lots of people have been trying it. The idea also has plausibility based on thinking with fundamentals of how the body can compensate and act to protect itself both short-term and long-term, adapt to high amounts of substances coming from outside that it can’t control. Anyone interested in reading formal studies can use the Google or other search engines as well as I could. Finding no studies wouldn’t invalidate an idea, since relevant studies may not have been done yet. There can also be apparently contradictory studies, which may well be out there, considering how controversial the subject of high iodine usage has been. I tend to focus more on my own experience and observations of others over time than on formal studies or arguments by authority. I might find studies to agree with my own observations, but that would be an aspect of confirmational bias, otherwise known as cherry-picking your data. Today most people have been conditioned, in effect, to be “hung up” on formal science, have gotten into the knee-jerk habit of stridently demanding formal science and forcefully brushing anything else away with a sneer, whereas I’m more of an old-fashioned empiricist, where experience and reflections on it are considered more broadly. If people aren’t open to simply considering an idea on its own ground, thinking with fundamentals, using a search engine for themselves, even making their own observations (gasp! ), then they’ll just have dismiss or skip past the comments of this oldtimer. I have hypothyroidism and took iodine for a time. I found it was causing major fatigue and joint pain, especially after meals. I had brain fog too, and was almost unable to function. Once I stopped, I felt much better! Dr. Kahrazzian talks about iodine (and many other important issues!) in his book, Why Do I Still Have Thyroid Symptoms? For those of you asking about practioners in AL and TN, I know SC would be a bit of a drive, but I see someone in Greenville who has given me hope. I’m already feeling better in general after three visits, and it looks like I will eventually be able to stop taking Nature-Throid. It’s called Perfect Balance Natural Health. Jenny, Lyme seems to cause a lot of patients to convert T4 to RT3, the inactive hormone.So yes, you’ll feel worse. I’ve seen this mentioned on the stop the thyroid madness website based on Lyme patient reflections. So they move over to taking T3-only, which is a better treatment anyway since T3 is the active hormone. They take it three times a day. Once they are in better control of their Lyme, they move over to desiccated thyroid. Thanks, Jane, for your thoughtful comment. I really do believe that Lyme is behind a LOT of the odd symptoms I’ve been having. It’s a very nasty little bug to pick up and, despite what the CDC says, it’s hard to rid yourself of it entirely.